This is not a fault of the pump but bad installation. The electrical control box on the pump can be on either side or on top but should never be below the pump as it is in this picture. This doesn't affect the operation of the pump but it makes the pump vulnerable to water damage of the electrical components. The chromed disc in the centre of the black circular face can be removed, giving access to the end of the spindle or shaft. It is also used to vent the pump. In either case a small amount of water can run downwards so the electrics need to be kept out of the way. 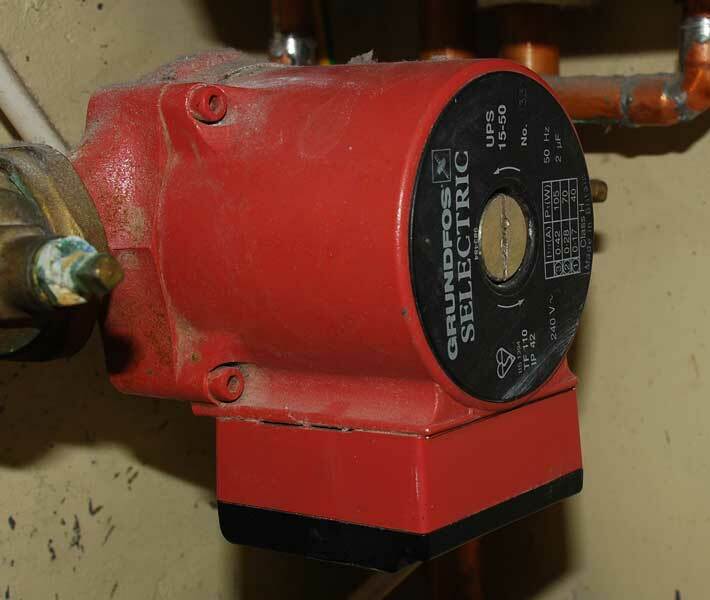 When the pump is supplied, the position of the electrical control box can be changed by rotating the head of the pump. There are 4 Allen bolts (2 are visible in the photo) which can be removed to rotate the head relative to the body of the pump. The direction of flow of the pump will always be as marked by an arrow on the body of the pump, no matter which way the head is orientated. The circular face of the pump should never face downhill or the pump will wear much more rapidly than it should. This pump faces horizontally, which is correct, but facing slightly uphill would also be fine. The pump should also not be installed with the black circular face on top as it makes it more difficult for the pump to expel any air and leads to rapid bearing wear. 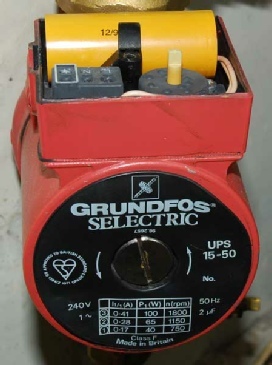 We feel that Grundfos make the best central heating circulating pumps currently available and see many which are between 20 and 30 years old. Both the Grundfos 15.50 standard pump and the Grundfos 15.60 high head pump share the same dimensions. Both are 130 mm between the valve faces. The difference between the pumps is just the power. The 15.50 produces 5 metres of head and the 15.60 produces 6 metres. As of 2015 the 15.50 and 15.60 pumps have been replaced by the UPS2 15-50/60 which has a 6 metre maximum head and is dimensionally identical to the 15.50 and 15.60 it replaces. Grundfos also produce the Alpha 2L 15.50 and Alpha 2L 15.60 pumps. Late in 2015 we had trouble with three UPS2 15-50/60 pumps which were all only a few months old and had similar faults. They would give a brief pulse or a series of pulses but not continue to run. We returned them under guarantee and have been using Alpha 2L 15.60 pumps which work fine. Wiring the flex into the Alpha 2L pumps is, however, a bit of a pain! Customer reported heating system blowing fuses. A 3 amp fuse would blow as soon as the heating circuit isolating switch was switched on. Our experience is that blowing fuses are almost always caused by water leaking into electrical circuits or by a failed pump. We checked the controls visually, boiler, motorised valve and pump but there was no obvious water leakage so we suspected the circulating pump. Removing the electrical cover from the pump we could smell the diagnostic smell of failed electrics. Hard to describe, it's a sourish chemically smell but you quickly come to recognise it. With the system isolated electrically we disconnected the brown live wire of the flex supplying the pump and made it safe. We fitted a new 3 amp fuse after first checking the fuse for continuity to confirm it was OK. It's too easy to mix up fuses. We always try to throw blown fuses away immediately but we tend to check new fuses before we fit them. It saves chasing up blind alleys. The standard fuse (in the UK) is 3 amp, never more. Switching on again, the system ran and the boiler fired up (an old, reliable Ideal Concord WRS 255A boiler), without blowing the fuse. Just to be sure we switched off, re-connected the pump and switched on again. The fuse immediately blew. Changing the pump was straightforward as the gate valve type pump isolation valves worked fine. These valves usually work OK, unlike the slightly smaller, ball type isolation valves with a screwdriver slot or a peg to turn through 90°. The screwdriver slot type valves are awful, often won't turn and when they do, they leak. Isn't it time someone made really good valves, like the full bore lever valves which are around? 2015 Update: There are now full bore lever circulating pump isolating valves available and they’re not too expensive. The make we use are called Perfect Pump Valves and we’d never go back to the old style isolating valves! As is often the case, the flex connecting to the pump had oxidised ends (where the copper has gone very dark brown or even blue/green. The flex was long enough to allow us to cut it back to a clean section. We used a new Grundfos 15.60 high head pump. Changed the fuse and everything worked fine.